Natalia Bravo braces herself for the ball. 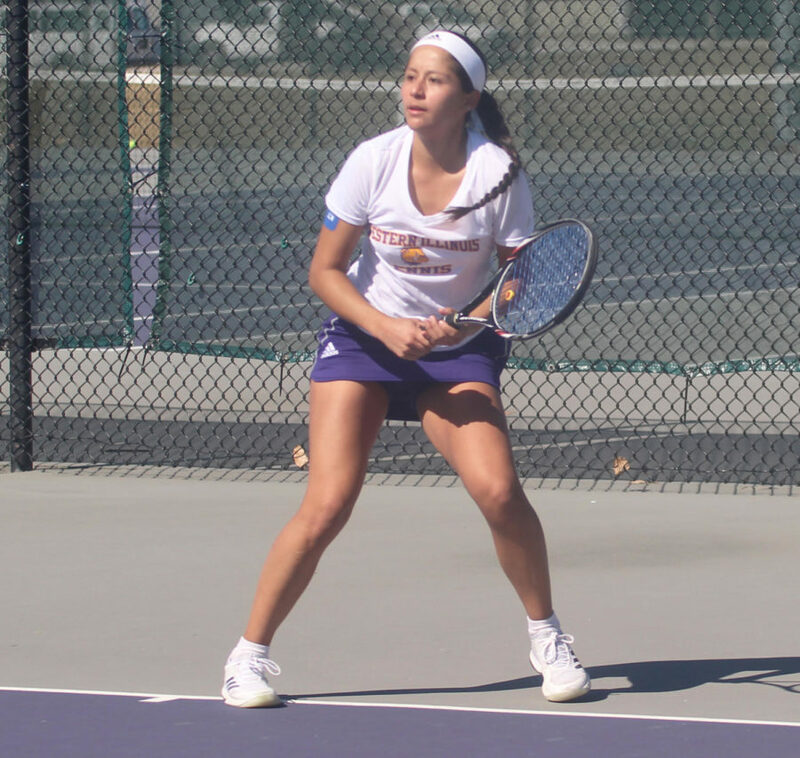 DENVER, Colo. — The Western Illinois University women’s tennis team concluded their season over the weekend when they went down in the first round of the Summit League Championships, but let’s take a look back on the entire season and how they got there. They started off their spring season with a 7-0 sweep over the University of Green Bay Phoenix, but then lost their next two matches to cross state rivals Eastern Illinois University and Bradley University, 7-0 and 4-3 respectively. They bounced back though to beat St. Francis 9-0. The next day they were up against the Illinois State Redbirds and dropped the match 4-1, but once again bounced back the next day to beat St. Ambrose 8-1. 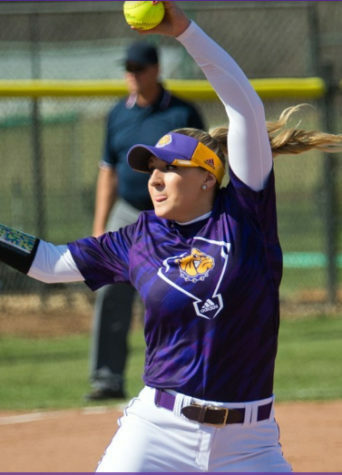 The Leathernecks then lost two straight against the Drake University Bulldogs and Colorado State, but then went on their longest win streak of the year with four consecutive victories. They started that run against the Southern Illinois University-Edwardsville Cougars 5-2. They then had a fantastic comeback win over the Missouri State Bears in their home opener. The Bears would take an early 2-0 lead in that one, but after winning four straight singles matches they were able to bounce back and win the match 4-3 in front of their home crowd. Western continued to win against the University of Maryville back on the road 6-3. They were then scheduled to play the University of Illinois-Springfield, but it was rained out. They did however win out over the Southeast Missouri State RedHawks 4-3. At this point in the season the Leathernecks sat at 7-5, which was just fine for their standards. They would have liked to win a couple more on the road. Western now starts facing Summit League foes to determine if they would make the tournament. Things didn’t look that good when they had back-to-back loses versus the University of Omaha Mavericks and the University of South Dakota Coyotes, both times losing 5-2. They were of course able to bounce back and beat the South Dakota State University Jackrabbits and the Oral Roberts University Golden Eagles both times 6-1. They secured the four seed in the Summit League Championships, meaning they would face the University of Denver Colorado Pioneers. Head coach Mirko Bjelica was very proud of his side as it was their first tournament appearance in four years. “We did what we had to this weekend in order to make the Summit League Tournament. The girls did it in singles again, excellent effort from everyone in the lineup,” Bjelica said. Western qualified for the tournament with two matches left. They were supposed to play the Pioneers and then finish their season at home against the Quincy University Hawks, but that wasn’t the case. The match against the Pioneers got rained out and postponed. So, with that, the Leathernecks would go on to celebrate senior day against Quincy. The team said goodbye to three women who each played their part to get them where they were. Maria Bessmertnaya, Courtney Lubbers and Cary Milanes all said goodbye in the 7-0 win at home. The match against Denver would get made up though, a few days before the tournament where Western was swept 7-0 against their first opponent in the tournament. With the last match of the season in the books, the Leathernecks still finished a positive 10-7, and were ready to turn themselves around in the Summit League Championships. Western went out in the first round 4-0 to the team that have beat them four years in a row. The four- time reigning Summit League Champions made easy work of the Leathernecks, coming out strong to grab the doubles point. Both doubles teams dropped 6-1 for Western, with the freshman Bjelica sisters Mary and Ana teaming up and sophomore Laura Ballesteros with Milanes. After three straight singles losses, the Pioneers clinched the match to end the Leathernecks’ season. Things aren’t all bad though, as two returning players were both named All-Summit League honors. Ana Bjelica along with Natalia Bravo earned the status after successful seasons for them in singles and in doubles. So, with all that it’s goodbye for now, but the Leathernecks have a lot of great talent returning next year, and look to return to the Summit League tournament even stronger.